Throughout what seems like months of research (well, it probably is actually) I’ve done on air purifiers, the one thing I’ve learned is it’s really important we all think about the quality of the air we breathe in our homes. I do however, have some good news/bad news – there are tons of models to choose from! For instance, there are many air purifiers which offer varying degrees of filtration. This could be 3 or 4-Stage filtering, ionizers or UV light filtering. But, as you might have expected they cost a lot of money. If you don’t need all that extra protection and rigorous filtering, you might be better off buying a cheaper purifier. Since the Honeywell Long-Life Pure HEPA QuietCare fits the description perfectly, I decided to take a closer look. Honeywell is one of the best known brands of air purifiers, and they have some great products which is why I have chosen to review this particular model. The Honeywell QuietCare 17000 is suitable for rooms up to 168 square feet in size, and the unit’s dimensions are 15.8 x 13.1 x 17.1 inches. It also weighs just 13lbs so it can be termed as a portable purifier plus, it has a practical handle on the top. It uses a True HEPA filter to collect harmful airborne particles along with a pre-filter which eliminates most odors. What’s particularly impressive about the Honeywell 17000 is its IntelliCheck system which allows you to monitor the status of the filters, and lets you know when it’s time to replace them. The way this works is very simple. Each filter has its own dedicated button which once pressed, activates a light which lets you know the status of the filter by blinking or shining continuously. You need to replace the HEPA filter either once a year, or once every three years depending on how much you use the purifier. Pre-filters however, need to be changed every three months. The Honeywell 17000 has three fan speeds for you to choose from, low, medium or high. At low and medium settings, the air cleaner is extremely quiet and doesn’t get in the way of your other activities such as working, reading, watching TV, or sleeping. When set to high, it is still pretty tolerable although those who are sensitive to noise might want to use this setting when they’re out. When it comes to efficiency, the Honeywell 17000 does the its job well boasting an ACH (Air Changes per Hour) rating of 6x which means its capable of changing the air completely 6 times in one hour. This model’s CADR (Clean Air Delivery Rate) rating is 130/130/130, which means it’s able to filter 130 cubic feet of air per minute containing dust, smoke and pollen respectively. Despite its filtering abilities, the Honeywell 17000 needs very little power, only 80 watts when set on high which is similar to a standard light bulb. What I love most about Honeywell products is their long-standing warranty, and the QuietCare 17000 is no exception because it arrives with a 5-year warranty. I wasn’t able to find anything wrong with this model although some people complained about it being too loud when set on high. 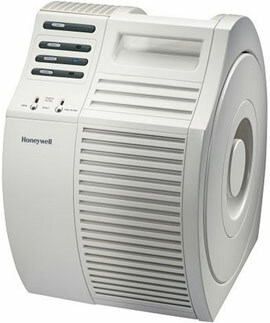 The Honeywell QuietCare 17000 Air Purifier is another great offering from this manufacturer, and will be especially appreciated by those suffering from allergies and asthma. It’s also affordable which means you won’t have to spend a small fortune in order to breathe clean air. True HEPA filtering technology makes sure that all allergens and pollutants are dealt with efficiently, and an activated charcoal pre-filter gets rid of odors. I think the Honeywell 17000 deserves a recommendation! If you are interested in buying one feel free to take a look on Amazon.